Remove the stalks from the red chillies, chop in half and soak in the vinegar for 15-20 mins. Mix all the ingredients with the Chillies and Vinegar. Put in a blender and make into a smooth paste and store in jars. Do not add any water. 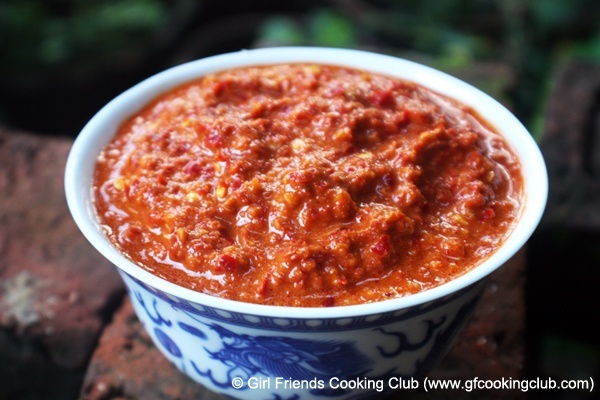 This chilli paste can be used for cooking and can also be used as a dipping sauce. This entry was posted in Grand Ma's Recipes, Pickles & Chutneys and tagged Chilly /Sauce by Kamakshi. Bookmark the permalink. wow! I am surely making this as it sounds exotic and nothing like home made!